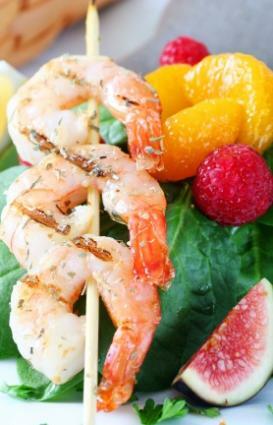 Marinated grilled shrimp is a quick, easy and healthy meal that you can prepare all year around. With the availability of indoor grills, you no longer need to wait until summer for marinated grilled shrimp. Best of all, you can have dinner ready in about 30 minutes with minimal work. Marinated grilled shrimp is so easy to make that you don't even need a recipe. In about 30 minutes, you can have a healthy entrée or appetizer. The quickest and easiest way to make grilled shrimp without a recipe is to buy a pre-made seafood marinade at your local grocery or speciality store. Simply marinate the shrimp in the refrigerator for about 30 minutes and then skewer the shrimp and pop it on a well oiled grill. Grilling time takes about three minutes per side, or until the shrimp is pink and opaque. One trip through the supermarket will show you that there is a wide variety of options when choosing shrimp to grill. From the small shrimp used in shrimp cocktails and salads to jumbo shrimp, you can choose shrimp in a variety of sizes. Not only that, but shrimp is available fresh, frozen, previously frozen, with shells on or shelled and deveined. For the quickest and simplest meal, you may want to choose fresh or previously frozen shrimp that has been deveined and shelled. Without having to thaw, devein or shell shrimp, you can have your meal on the table in about 20-30 minutes with very little prep time involved. Because you are marinating the shrimp, your best bet is selecting shrimp that doesn't have the shell on it, or removing the shell from the shrimp yourself. Some people choose to buy shell-on shrimp because there is typically a little bit of a savings if you shell the shrimp yourself. While it is a bit more time consuming, if you buy shell-on shrimp that you plan to marinate, then it will be necessary to remove the shells prior to marinating so that the shrimp soaks up the flavors of your marinade. Shrimp that you plan to marinate and grill should be raw. Although it is possible to toss pre-cooked shrimp onto the grill to heat it up, you won't get the same quality of flavor or texture that you will by marinating raw shrimp and then grilling it. Raw frozen shrimp is actually a very good option for many people. Most raw frozen shrimp is flash frozen so that the shrimp retains freshness and texture. While there is some loss of texture in the freezing process, most people don't mind the slight difference in texture between fresh and frozen shrimp. Marinades for grilling shrimp are easy to make and just take a few minutes. Marinating your shrimp can add flavor and moisture, which is especially important when you are using a dry heat method for cooking, such as grilling. A basic marinade contains equal parts of vegetable oil and an acid such as vinegar or citrus juice. Other herbs and spices, salt and pepper can then be mixed in to flavor your shrimp any way you want. Below are a few marinades for grilled shrimp. In a small bowl, whisk together 1/2 cup of champagne vinegar, 1/2 cup of olive oil, 1/4 teaspoon of salt, two grinds of fresh cracked black pepper and two tablespoons of chopped fresh tarragon. Toss with shrimp and allow shrimp to marinate, covered and refrigerated, for 20-30 minutes. In a small bowl, whisk together 1/4 cup of canola oil, the juice of one lemon, the juice of one large orange, two grinds of fresh cracked black pepper, 1/4 teaspoon of salt and four cloves of finely minced garlic. Toss with the shrimp and allow to marinate, covered and refrigerated for 20-30 minutes. Whisk together in a small bowl 1/4 cup of canola oil, 1/4 cup of fresh squeezed lime juice, 1/4 teaspoon of salt, 1 clove of finely minced garlic, a few grinds of fresh cracked black pepper, and 1/4 teaspoon of finely chopped or powdered chipotle chile. Toss the marinade with shrimp and refrigerate, covered for 20 to 30 minutes. Once the shrimp has marinated for 20 to 30 minutes, you're ready to grill your shrimp. Thread the shrimp on skewers without overcrowding them and place them on lightly oiled grill that has been preheated to high heat. Grill the shrimp for about three minutes per side, until the shrimp is pink and opaque. Serve immediately. It's easy to make grilled marinated shrimp. With minimal preparation and about 30 minutes of your time, you'll have a main dish that your family or guests will love.